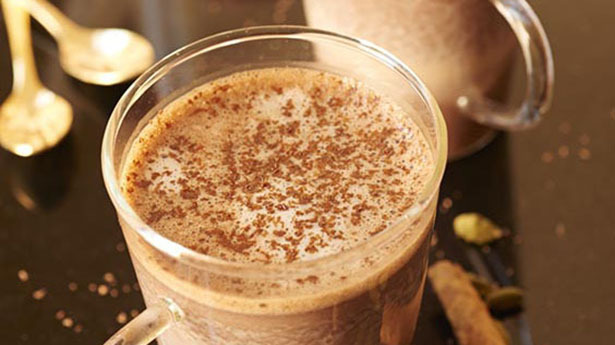 Add exotic Moroccan flair to a mug of hot chocolate with cinnamon, cardamom and orange rind. Bring 2 cups low-fat chocolate milk to a boil. Add cinnamon sticks, orange rind and cardamom pods in the milk mixture. Remove from heat and let stand 10 minutes. Meanwhile, finely grate chocolate and place in a bowl. Set aside. Using a metal strainer, carefully strain out spices from milk mixture. Pour hot milk mixture over chocolate. Stir mixture until well blended. In a saucepan, froth remaining cup low-fat chocolate milk. Pour into individual mugs and top with foam. Sprinkle with grated chocolate, if desired.